Don’t forget we are having a very special Posh Party tonight! Style icon and fashion blogger, Anh of 9to5Chic, will be hosting tonight! 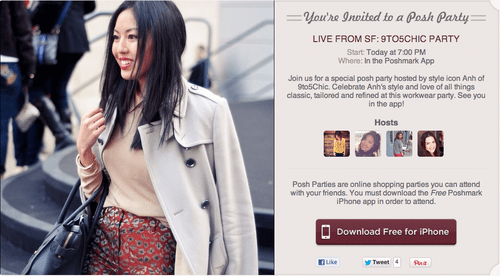 Tune in to the party starting at 7pm PST to shop with Anh and see her favorite Poshmark finds! And just in case you haven’t already done so, be sure to check out her Poshmark closet. Anh has some ah-maz-ing shoes that will drive any fashion-loving gal crazy! Next Post NEW! Posh Party Showrooms and New Hosts!